To ensure a comfortable stay, most of our rooms are equipped with a private bathroom with a shower or bath, toilet, hair dryer, telephone, television and free access to wireless internet. 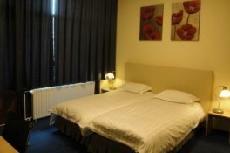 New City Hotel Scheveningen offers comfortable rooms for budget rates. The Basic Roomtype is the only room type that has a bathroom in the corridor. All rooms on the back side of the hotel have a private balcony. The hotel does not have a 24-hour reception. Guests can check-in until 22:00 h. In case you would like to check-in after 18:00 h., you need to contact the reception in advance. If you cannot take up your booking, you need to cancel no later than 48 hours before your date of arrival. Please take into account that the date of arrival starts at 0.00 am (CET.) Any booking not taken up and not cancelled 48 hours before arrival will be billed at a cost equivalent to the price of the first night. A different cancellation policy may apply for group bookings. The hotel will contact you within 24 hrs. if this is the case. 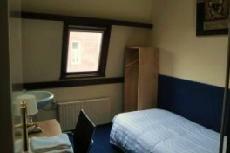 The basic single room is equipped with a television and a telephone. The bathroom needs to be shared and has a shower, toilet and a hair dryer. The double standard room is equipped with a television, telephone and a private bathroom with shower, toilet and hair dryer.